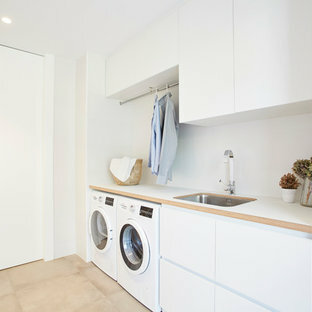 Utilitarian spaces such as laundry rooms seldom receive the attention they deserve — which is odd when you consider how often they're used. With the addition of custom built-in cabinets, an utility sink, washer and dryer, a properly planned utility room can serve multiple purposes: It can help simplify your household chores, store sports gear and school supplies, and even function as a grooming center for family pets. 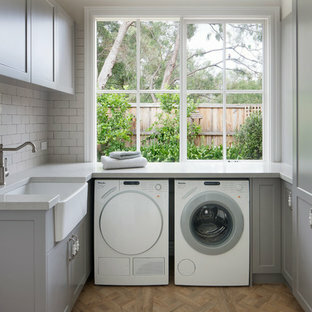 Because of its double- or triple-duty potential, a laundry room remodel is a good investment for you and your family. After you purchase your washer and dryer, think about installing some built-ins for your cleaning necessities. If you still have room to spare, consider what else the area can be used for, and set aside corners, cabinets or shelves for other purposes. 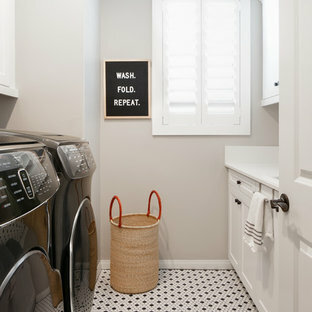 Once all the functional aspects are out of the way, you can finally incorporate laundry room decorations to complete the makeover and liven up those mundane chores. 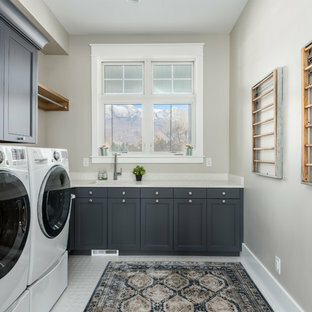 How do I add storage to my laundry room? 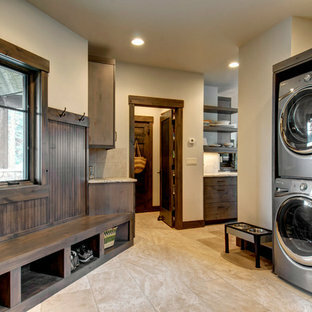 As you remake your laundry space, help it serve multiple functions by incorporating clever built-ins. Include shelves and cabinets to store supplies like hangers, clothespins, sewing kits, irons and detergent —the leftover space can store pet accessories and seasonal items. To ensure that you deal with clothes right away, give yourself a table nearby the washer for folding, a pull-out drying rack for hanging and a hidden ironing board for crisply ironed clothes. 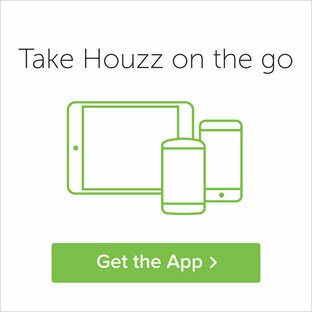 Making it a one-stop shop will ensure that all your chores get done at once — no excuses! What else can I use my laundry room for? 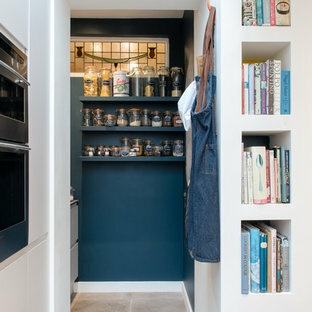 If you have a smaller home, using your utility room for multiple purposes is a great space-saving technique. Because it often has an utility sink, it naturally is a great place to feed and bathe your furry friends. It also easily transitions into a mudroom, where you can store extra shoes, sports equipment and winter clothing. If you have room for a built-in desk, it can be a drop station for mail, cell phones and keys — it can even function as a craft or wrapping station, with the right organization. Think about what your family needs the most, and incorporate that into the room. 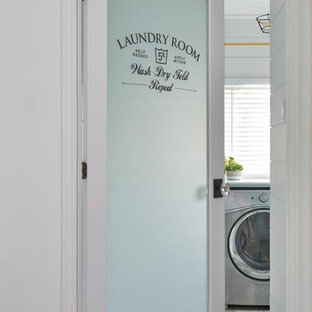 How can I decorate my laundry room? Because there isn't a lot of counter space to spare, take advantage of your walls when decorating. Bright paint or wallpaper can help make chores pleasant, while fun signs, posters, murals and wall decals can add some character to the space. Think of your storage containers as laundry room decor too: Find bins, baskets and hangers with fun patterns and colorful fabrics. By Soda Pop Design Inc.
By Connie Young Design, a division of ce de ce inc.
By Beyond Beige Interior Design Inc. Beyond Beige Interior Design | www.beyondbeige.com | Ph: 604-876-3800 | Best Builders | Ema Peter Photography | Furniture Purchased From The Living Lab Furniture Co.